been inscribed in the Unesco World Heritage List because of their exceptional beauty and uniquness. Looking at the map, it shows that Alta Badia can be found in the bottom of Val Badia, at the feet of the Passo Gardena and Passo Campolongo Falzarego, and that Alta Badia includes six villages: Colfosco, Corvara, La Villa, San Cassiano, Badia (San Leonardo / Pedraces ) And La Valle (The Valley). 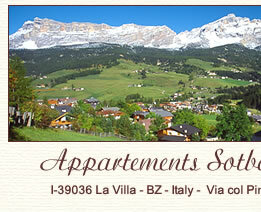 The Villa is the most central of the villages and is also conveniently located for excursions in the Sella group, or in the surrounding valleys as the Val Gardena, Val di Fassa, Val Pusteria, Cortina and Three Peaks. The scenery is something unforgettable pale rock castles, rising from the green fields. The queen of these wonderful mountains is the Marmolada glacier. 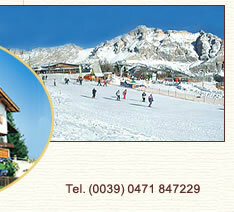 The name Dolomites has a meaning, the Dolomites were discovered by de Marchis Dolomieu, in the year 1788. Natural park: They represent an example of the great importance we give for the protection and conservation of various natural forms. Spend a few days of your holidays in these places so natural and charming parks and discover the relaxing force of nature! Walks - Lakes: The area of Alta Badia is covered by an extensive network of walks suitable for every type of tourist: the five countries, La Villa, S. Cassiano, Corvara, Pedraces and Colfosco can be reached by easy paths, indicated especially for families with children. For those who have allready trained more, may also try the highlands and why not also the near natureparks. To reach the heights there are also various lifts. Some lakes :Sompunt (20 minutes walk from La Villa), Boe '(2-hour walk from Corvara), Lagazuoi (1 hour and 15 minutes walk from San Cassiano / Alpine Hut), Lee (10 minute walk from the station upstream of the lift Santa Croce / San Leonardo). 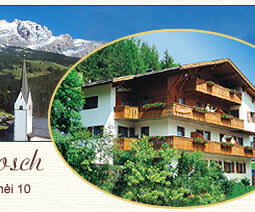 Nearby lakes: Lake Fedaia (45km), Lake Misurina (55km), Lake Braies (70km), Kalterer (100km via Val Gardena). Culture and language: The people from Val Badia speak Ladino, the oldest languages in the Alps. The Ladin culture is highly respected and conserved by the Ladins, therefore you can still admire authentic constructions and various museums full of interesting stories and articles. 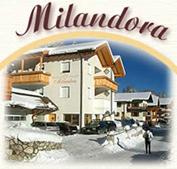 The range of accommodation in Alta Badia offers more than 15,000 bedplaces in hotels divided into: hotels, guest houses, bed & breakfast, apartments, , campsites, holiday homes, huts. For every season, the independent accommodation and tourism society organize for the clients various events, including guided tours, visits to farms with preparation and tasting of typical Ladin dishes, folklore evenings, multivisions, etc..